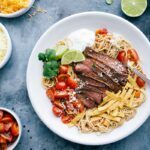 Mexican spaghetti topped with carne asada steak (OR chicken) and all the right toppings make for the ultimate fideo recipe! One of my family’s favorite places to eat is a local Mexican restaurant that serves the best sweet pork tacos (sweet pork tacos copycat here!). Whenever we go there I end up ordering the same thing because I’m obsessed with it. However, a few weeks ago I finally branched out from trying the same thing and gave their “fideo” a try! Fideo translates to “noodle.” Sopa de Fideo is a Mexican noodle soup made with a tomato-based broth. And the fideo I’m sharing today (restaurant copycat) is essentially a Mexican version of chicken noodle soup with a lot less broth and topped with your choice of delicious toppings. Those topping options consist of steak or chicken, shredded jack cheese, cheddar jack cheese, grated cotija, tortilla chip strips, cilantro, serrano pepper, pico de gallo, lime, and/or sour cream. Yum! Fideo is the Spanish word for noodle. For Mexican or Spanish dishes, the dry pasta is first toasted in oil. This adds so much flavor to the final dish and it’s easy to do! 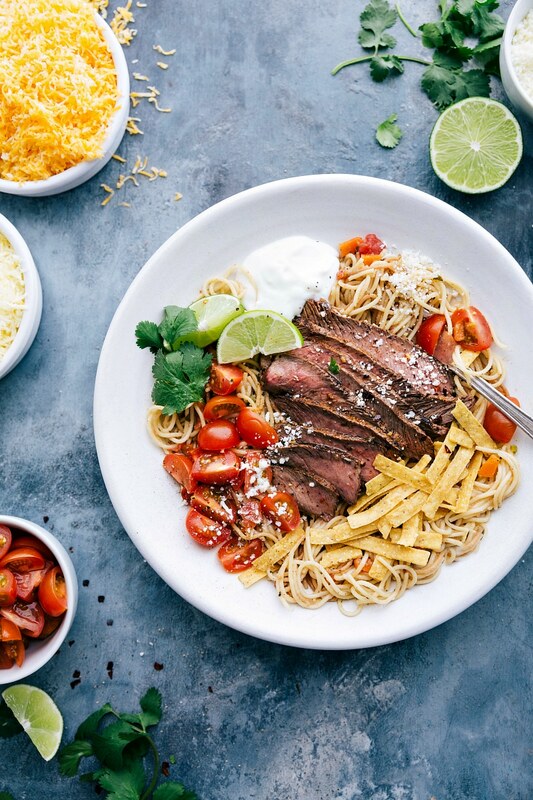 Below is a more time-intensive, but flavorful way to preparing steak to add to this fideo. 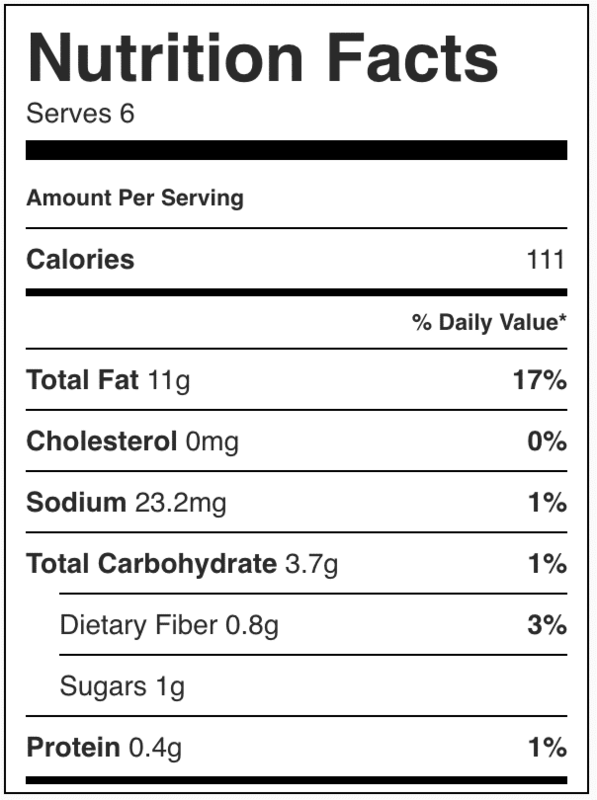 See below for a simplified version plus a recipe for adding chicken. PREPARE STEAK: combine all of the marinade ingredients. Using a fork, poke holes about an inch apart all over the steak on one side only. Place the steak in a large freezer bag and pour all but 1/4 cup marinade over the steak. 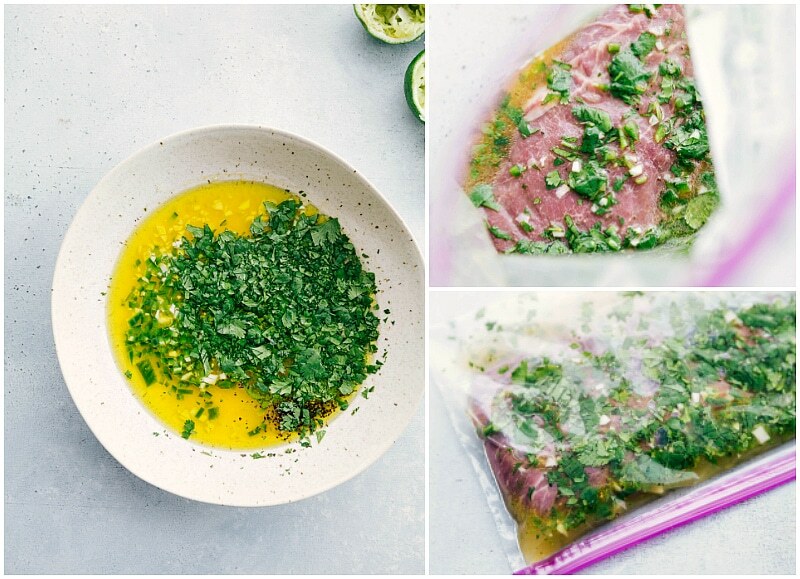 Massage marinade into the steak, seal up the bag, and place in the fridge. Refrigerate for at least an hour and up to 8 hours, turning the steak at least once. Remove steak from the fridge 30 minutes before cooking and let stand at room temperature. Skillet Option: Drain marinade from meat and pat dry with paper towel (we don’t want to stew the meat). Heat a cast iron skillet over medium-high heat. Cook steak for about 4-5 minutes per side or until steak is medium rare (130-135 degrees F). Baste with reserved marinade. Let the meat rest on a cutting board, tented with aluminum foil for 5-10 minutes. Slice very thinly against the grain into strips. Below is a simplified way of preparing steak or chicken to add to this fideo. See above for a more time-intensive, but flavorful version of steak. Rub steak with olive oil on all sides. Sprinkle seasoning blend evenly over the entire steak and rub in. Follow directions above to cook in skillet or on grill. Halve breasts horizontally so they are an even thickness. Sprinkle seasoning blend evenly over chicken and rub in. Grill or cook chicken in a skillet (add 1-2 tablespoons oil in a skillet or generously grease grill/grill grates with oil) until cooked through (internal temperature 165 degrees F). Add 2 tablespoons olive oil to a large pot that has a lid. Place over medium heat. Add the carrot and cook for 3-4 minutes. Add in both onions and garlic and cook until the veggies are fork tender. Next, add in all of the spices. Toast the spices for 1-2 minutes or until fragrant. Stir constantly (or reduce heat as needed) to not burn the spices. Remove the veggie/spice mixture back to that bowl you measured your spices in and set aside. Add remaining 2 tablespoons olive oil to pot. Reduce heat to medium low. 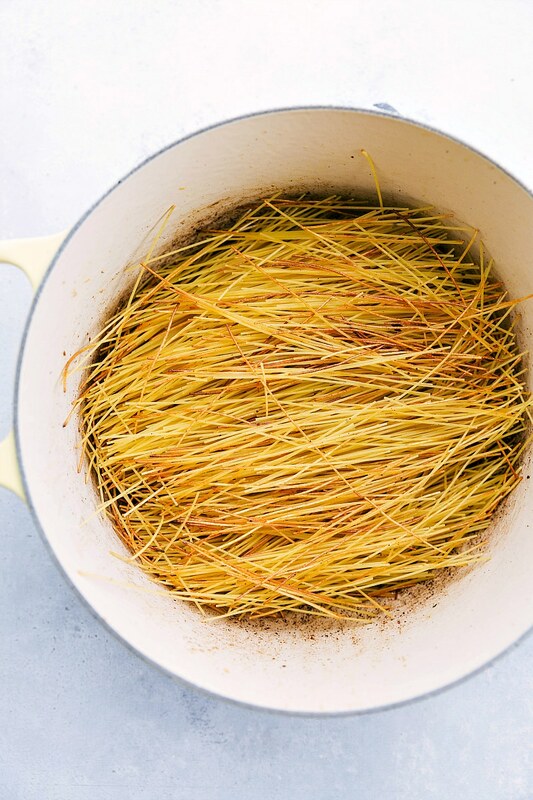 Break the angel hair pasta exactly in half and add to pot. Cook the dry noodles while constantly stirring for 3-5 minutes. I use tongs to flip/stir the noodles since they're still quite large. Cook until the noodles have turned golden brown and are slightly blistered. Turn off the heat. 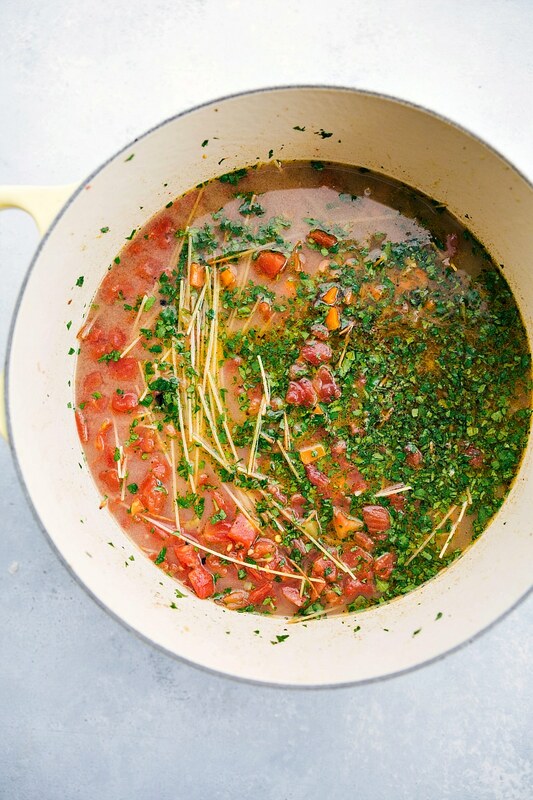 Add in the entire can of diced tomatoes (don't drain), cilantro, lime juice, set-aside veggies and spices from step 1, and 6 cups of chicken broth. Stir. Turn heat on to medium high and bring the mixture to a boil. Cover the pot and reduce the heat to a rapid simmer. Cook until the noodles are soft and have soaked up most of the broth. Remove from the heat. Stir in the remaining 2 cups of chicken broth and it's ready to serve! While the noodles are cooking, prepare the toppings. Finely shred monterey and cheddar cheese. Set out tortilla strips and sour cream. Chop some cherry tomatoes OR make a quick pico. Set out additional lime wedges and/or cilantro. Prepare the steak or chicken topping - see the last two paragraphs in the post for directions. Assemble by serving up the pasta and broth into large bowls. 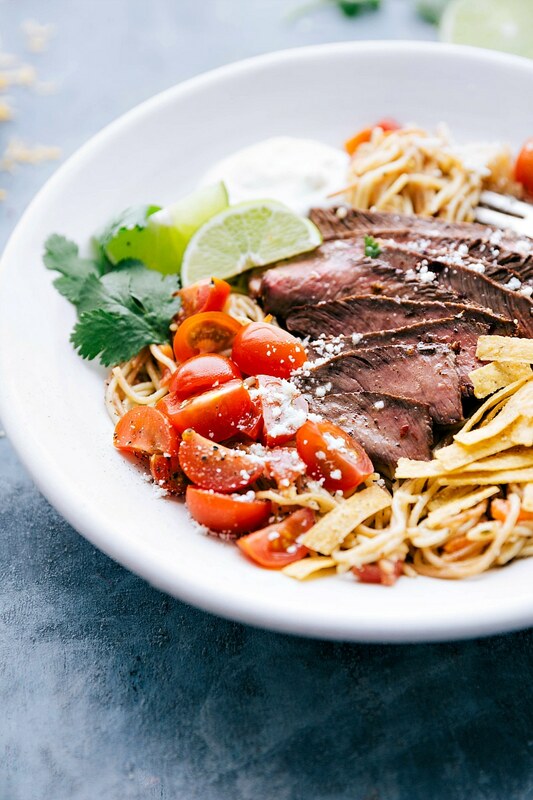 Add your favorites in this order: monterey and cheddar first, steak or chicken next, sour cream, tomatoes/pico, cilantro, lots of tortilla strips, cotija, and a few squeezes of fresh lime. Enjoy! Note 1: to prepare the chicken or steak there are a few options (marinate steak OR use a carne asada rub to rub over chicken/steak and then cook or grill). Read the last two paragraphs in the blog post for directions.